When Paul Gauguin painted his famous masterpiece ‘D’où Venons Nous / Que Sommes Nous / Où Allons Nous’ (Where Do We Come From, What Are We, Where Are We Going To) he was simply asking the questions that people have always asked. They are the questions that make us different from other animals. Gauguin painted this in Tahiti at a particularly difficult time, after receiving news of the death in France of his beloved daughter Aline, aged just 19. One can sense his despair and confusion, his desperate search for answers. What’s it all about, what’s the point of living, he seems to be asking. We are still asking these questions, even though we never get an exact answer. But we can get some ideas about it all. They are questions that are particularly relevant when we are in recovery from addiction. Gauguin’s painting (read it from right to left) starts with birth and ends with death and is full of mysterious symbolism. The figures appear to be in some form of trance or dream. Addiction puts us into a trance-like state too, a sort of sleep, and when we wake from it, the world can seem a frightening place – we are like children who have to learn about the world and their place in it, all over again. 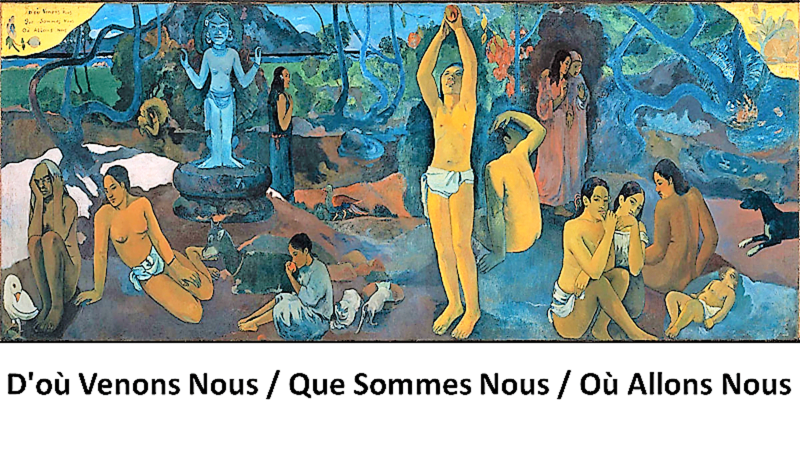 We ask the questions Gauguin asked – where do we come from, what are we, where are we going? Like children, we are frightened and anxious, needing help. People trying to answer Gauguin’s questions often start as Gauguin seems to have done, in his painting, with the child. Childhood can be frightening but it is also the time when we learn the most, and the time when learning comes to us quicker and more easily than in later life. We carry our childhood experiences around with us for the rest of our lives and we call this our ‘Inner Child’. Our Inner Child is an important factor in our search for who we are. Yet for many people, the idea of getting in touch with an inner child requiring nurture, is as alien as taking their clothes off in public. Definitely a step too far. Such people need skilful help to open their minds to new ideas and one method is through poetry. Through poetry, reading it or writing it, we get to see things differently, we find new ways of expressing our deepest feelings and we learn things about ourselves. Here are some mind-opening examples. Love lost as soon as won. And all the sheaves to bind! Poems like these make us yearn for our own childhood and fill us with a nostalgia for a time that may never actually have existed for us. Whether or not our own childhoods were happy experiences seems immaterial. And cannot come again. (A E Housman). As scarred and toughened adults, we still hang onto our inner child and desperately try to protect it from the horrors of ordinary life that we ourselves have had to deal with. And when life has been especially rough to us, as in the case of addiction for example, we become sad and ashamed of the way that we have treated it. This shame and guilt, often manifested as depression, self-loathing and sometimes, self-harm, can immobilise people and can stop them from taking positive action for their recovery. In therapy, recognising one’s inner child and understanding its place in our psychological makeup, can represent a turning point in the recovery process. The next poem is poignant to the extreme, in the way that the writer expresses his feelings of protectiveness towards his helpless charge, as yet unborn, desperately wanting to shield it from the inevitable awfulness of everyday life. For anyone trying to come to terms with their situation involving pain, loss of dreams and unhappiness, the therapeutic value in connecting with the inner child that lies within us all is immense. Doing so will help with feelings of failure, guilt and despair. By reverting to this very basic human instinct of wanting to nurture another, we are in fact helping and nurturing ourselves. And thus we find forgiveness and new hope. ‘D’où Venons Nous / Que Sommes Nous / Où Allons Nous?’ (Where Do We Come From, What Are We, Where Are We Going To ?) – Gauguin asked these questions and our inner child asks us the same. We cannot answer because we do not know. All we can do is our best, for our inner child, and that means, for ourselves. Begin by nurturing the inner child.